1 Marketing Technology Industry Council In April 2017, the Marketing Technology Industry Council released the findings of its first study of senior B2B marketers' attitudes, beliefs and behavior towards marketing technology. The purpose of the survey was to identify the key challenges and opportunities presented by B2B martech today. Aer several months of analysis, the poll's findings now form the basis of a series of recommendations on how marketers can get the most out of their technology budgets, and avoid the major pitfalls inherent in building a martech stack. SUMMER 2017 RECOMMENDATIONS Summary of key challenges The poll highlighted four major challenges B2B marketers are generally facing with their technologies: In this document, we offer an answer to the following question: RECOMMENDATIONS What's a marketer to do? 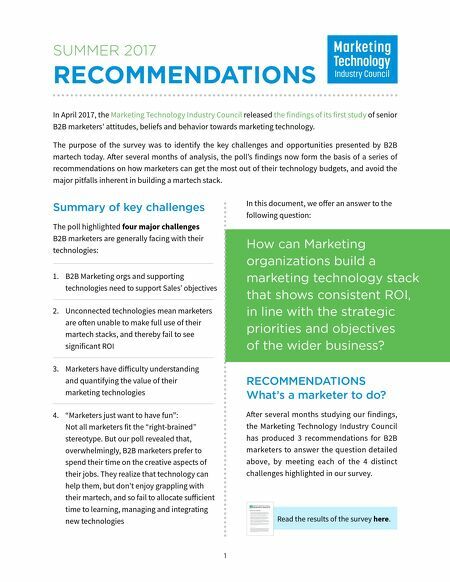 Aer several months studying our findings, the Marketing Technology Industry Council has produced 3 recommendations for B2B marketers to answer the question detailed above, by meeting each of the 4 distinct challenges highlighted in our survey. Read the results of the survey here. 1. B2B Marketing orgs and supporting technologies need to support Sales' objectives 2. Unconnected technologies mean marketers are oen unable to make full use of their martech stacks, and thereby fail to see significant ROI 3. Marketers have difficulty understanding and quantifying the value of their marketing technologies 4. "Marketers just want to have fun": Not all marketers fit the "right-brained" stereotype. But our poll revealed that, overwhelmingly, B2B marketers prefer to spend their time on the creative aspects of their jobs. They realize that technology can help them, but don't enjoy grappling with their martech, and so fail to allocate sufficient time to learning, managing and integrating new technologies How can Marketing organizations build a marketing technology stack that shows consistent ROI, in line with the strategic priorities and objectives of the wider business?